For use with MJT 2221 CCU. Includes all sideframe castings and bolster detail. Four sides - sufficient for two bogies (one coach). 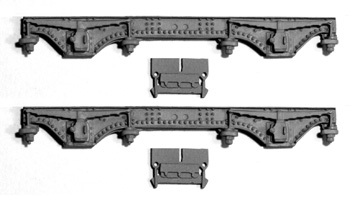 MJT cosmetic bogie side are supplied without brake shoes which are available separately - MJT items 2461 and 2462.